Every business needs to receive feedback. Proper feedback can tell business owners how well their business is performing. By gathering as much feedback as they can, all the information gathered are vital in ensuring the success of the business. Which is the reason why every type of feedback is considered essential. One must learn to both give and receive feedback. By knowing how to provide productive and efficient feedback, one can help another grow and develop to ensure that the person is able to reach certain goals. By learning how to receive feedback, one can learn use the information received as an opportunity to fix problems and improve to achieve success. 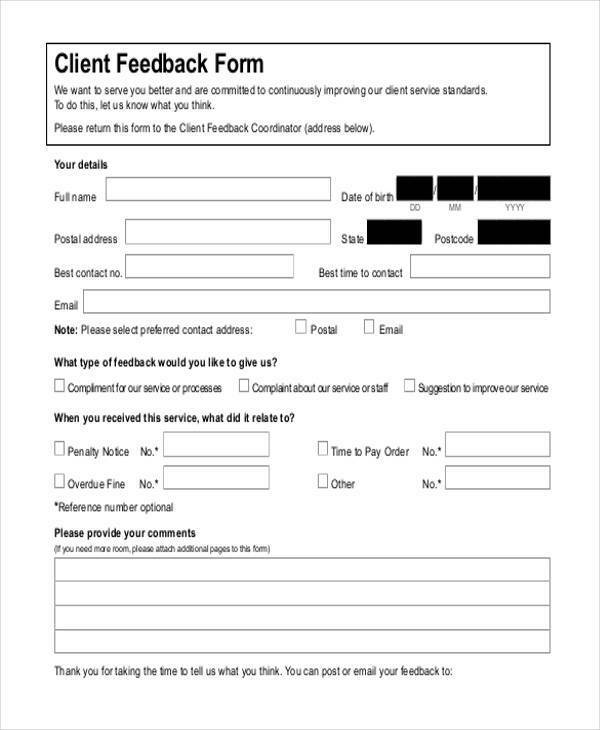 What Is a Client Feedback Form? 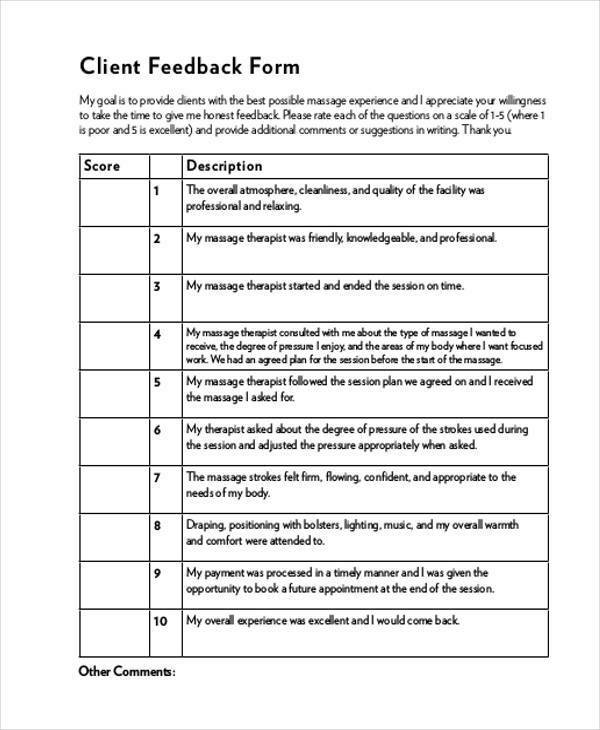 A client feedback form is something that many businesses take advantage of. With the help of these forms, businesses are able to determine what their clients like about the services that they are receiving as well as the parts that the client are unsatisfied with. With these forms, these businesses can look into the different factors that determines the success factor of the services that are provided. 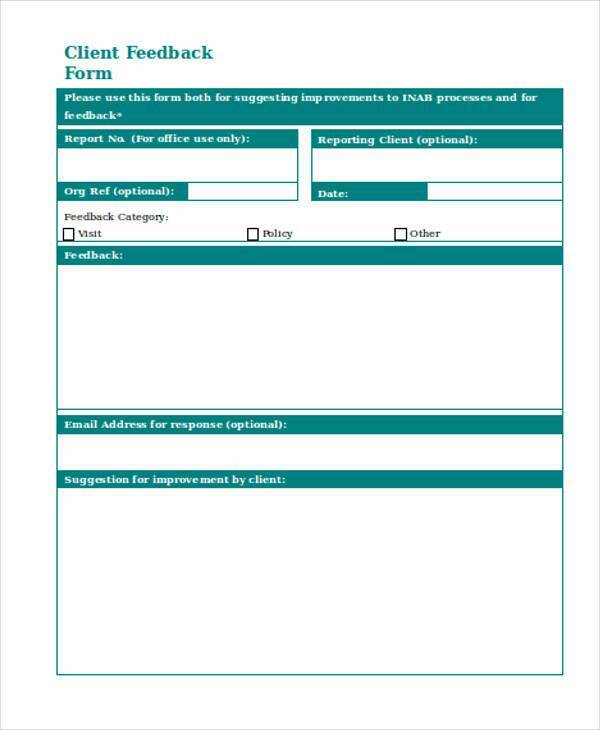 So if you’re a business manager or a business owner, then taking advantage of these forms and knowing how to properly use them will help guarantee that your business and its services that your clients can rely on. The big difference between the two is in the matter of loyalty. A customer can be a one time or repeat patron, but it’s someone who isn’t particularly loyal to the company providing products and services. A client is someone who has built a close professional relationship with a company. Another difference would be that unlike customers, clients buy a company’s advice and solutions that are personalized to meet their particular needs. So if you gather feedback made by customers, you could use the information to help you making sure that they become your clients and that they always go to you for whatever they need. It will help you improve your services in the long run. The main reason why your client chose your company in the first place is because that person trusts the quality of service you are able to deliver. If there are any problems or if there are small suggestions that your client makes to help improve your business’s services, then you can use the result of the client feedback forms gathered and make the decision as to what action you should take. It will help make your clients feel more appreciated. By letting your clients participate in surveys or questionnaires, you show that them that you truly value their opinions and you are using them to help you figure out the best methods that will satisfy their needs. Not only will it show your clients that you value them, but it also shows that you wish to retain them as loyal customers to your company. It could help you gather more clients. By listening to your the feedback made by clients and gaining a great reputation with them, there is a chance that they could spread it among others that could potentially gain you even more clients. 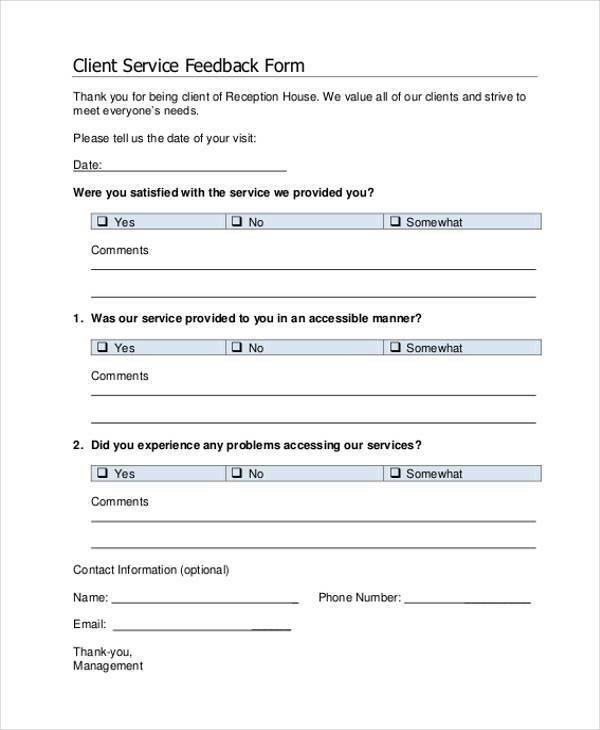 And if you have your clients answer feedback forms wherein they provide you with nothing but positive information about your business and services, then you may post the results on your business’s website or through social media pages. However, you will have to make sure that you gather the consent of your clients first before you do so. It can help boost the morale of your employees. If your clients have provided you with feedback with nothing but appreciation towards how well your services were provided, then the performance of your employees might just be improved and at the same time have their confidence boosted. 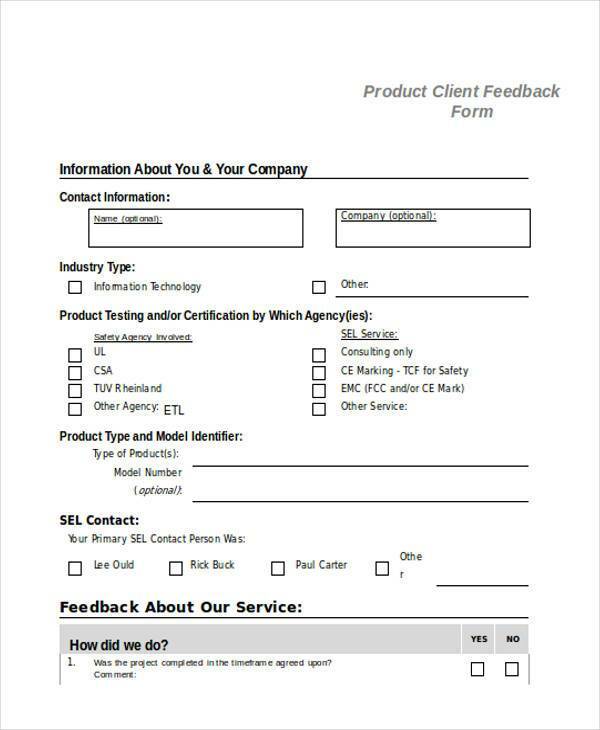 Client Satisfaction Feedback Form. This is the kind of form that’s utilized by clients wherein they specifically show how satisfied they are with the services or their dealings with a particular company. By gathering information on your clients based on their level of satisfaction, business managers and owners can determine the best course of action that will help them ensure that their clients remain satisfied. The reason being so that they ensure that the continue to do business with these people as well as not losing them to the competition. So if they have a complaint about a service that clients are not happy with, then it’s up to the business manager to determine the best course of action that will make them happy. 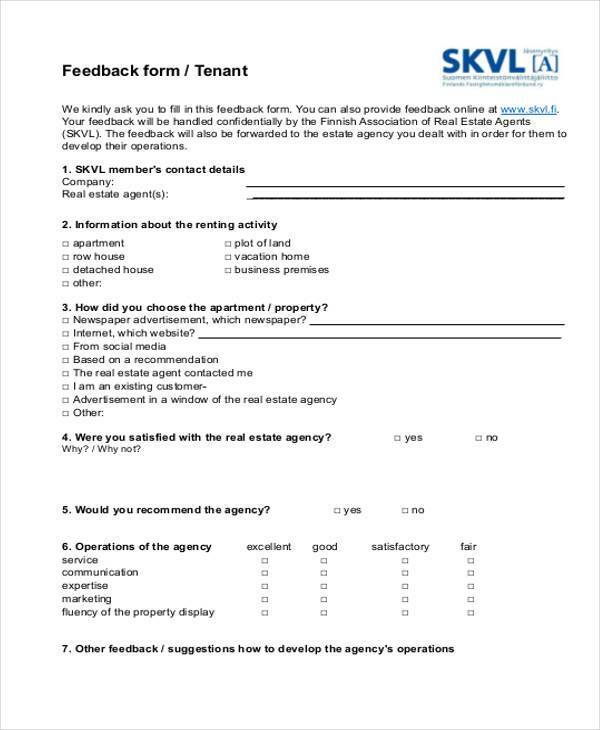 Real Estate Client Feedback Forms. This is what clients of real estate agencies wherein they show how well they thought of the agency’s ability to provide them with proper service. When clients make feedback for real estate agencies, the agencies are able to gain information as to how the clients came to find their agency as well as the details regarding the services rendered. This will also tell the agency if the client is willing to suggest to others that they should go to the particular agency whenever they require any real estate services that need to be done. 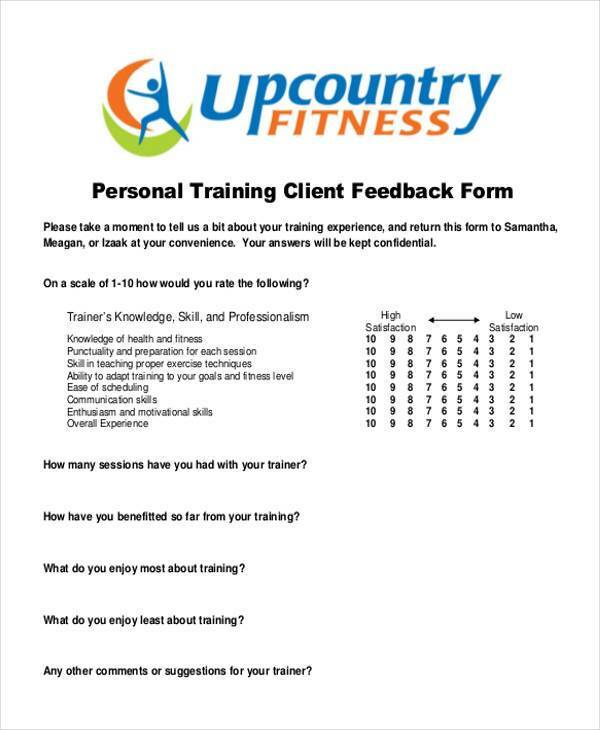 Personal Training Client Feedback Forms. This form is what is utilized by any client of a personal training course. What this does is allow the client to provide information regarding their personal training such as how well the personal trainer is able to communicate with the client, the lesson provided by the trainer, the schedule of the training session and much more. 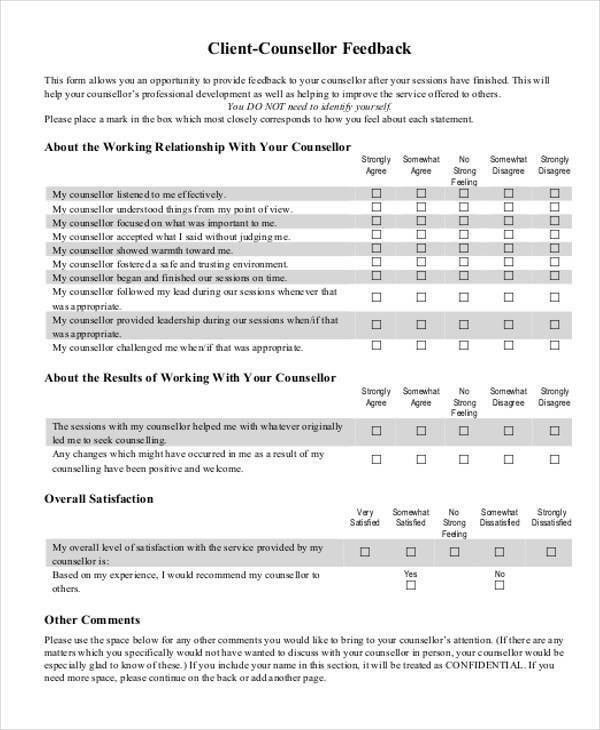 With this form, the client may also make suggestions on how to improve the personal training course in the hopes that these changes be made that would best suit the client’s needs. 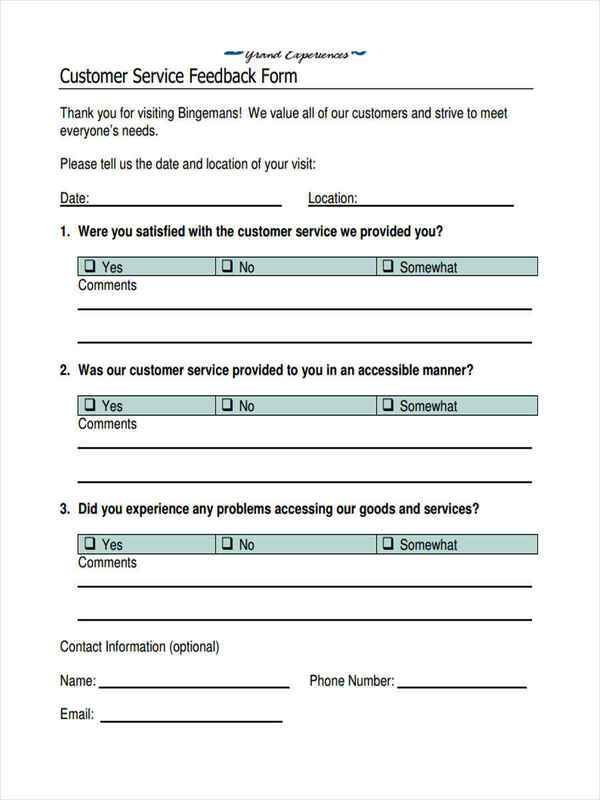 In the event that you would like to learn more about the different types, then you can go our feedback forms in Word that can help you get the information that will help you. Make a good first impression with possible clients. A customer’s first impression is very important within the business world. If you show that your business is something that’s dependable for high quality products or services, then you can expect customer to keep coming back to you for more. You don’t have to keep barraging them with e-mails or giving them links to your social media site, all you have to do is attend to their needs and let them know that you value them. So when they call you, you answer them right away. If they need to know more about your services, then give them a detailed description about what you offer or give them a link to your company’s website that will help them know what they need to learn. Make the payment experience one wherein your clients won’t be hassled with. Sometimes it’s a horrible experience when having to pay for the services that were rendered. Considering that one has to think of things such as the method of payment, how much should be paid, where should it be paid to and so on. So before your client starts paying, you will need to be transparent and provide all the information needed as to how, when, and where the client should pay. Try to make your business as accommodating as possible by allowing the client to pay with any method. This will give the client a much easier time and will most likely have him or her repeatedly ask for you services due to it being hassle free. Take note of the needs of all of your clients. There are many cases wherein your customer might want to attain your services on a regular basis. Keep track of when your clients might just need the service again. So it’s best that you have gathered your client’s contact information and send an e-mail or text when you know it’s about time that they’re due for another service appointment.